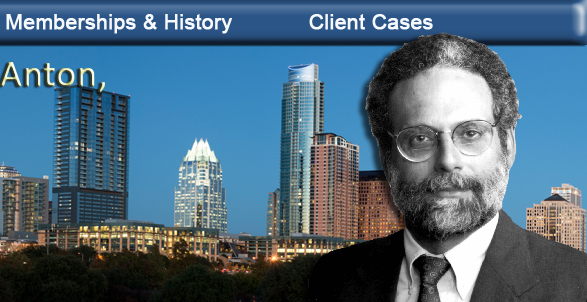 My name is Richard Anton, CEO of the Law Firm of RICHARD H. ANTON, A Professional Corporation. I am a business, commercial, and consumer litigation attorney who representsindividuals and small businesses in civil disputes of all types through negotiation, litigation, mediation, or arbitration. Civil Trial Law - Preparation and trial of significant civil cases, including negotiations and pre-trial work, rules of evidence, and trial procedures. Consumer & Commercial Law - Cases involving the purchase or lease of goods and services by consumers (either as individuals or as entities). 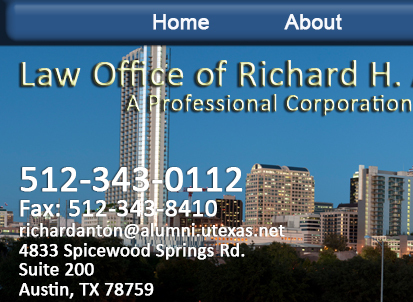 I also handle family law issues through my practice at Austin Family Law. If you need legal representation in the area of family law, please visit austinfamilylaw.com for more information on how I can help you. While my skills and experience cover a wide range of legal representation, obviously no attorney can be an expert at everything (and I would advise you to steer clear of any attorney who claims otherwise). But if your problem happens to fall outside my realm of expertise, I will be happy to refer you to my trusted colleagues in the legal community, to help ensure that you get the best possible legal representation for your particular needs. To help me determine whether I am the right attorney for you, please answer the brief questions on the left-hand side of this page, including a brief description of your problem, and submit the information to me. I look forward to evaluating your needs and helping you in any way I possibly can.